It’s crazy how an idea creeps into my head and once in I can’t seem to get it out. On Saturday I met a friend who, this summer, is riding the Leadville 100 mountain bike race in Leadville Colorado. Now, all of a sudden, I want to race Leadville. 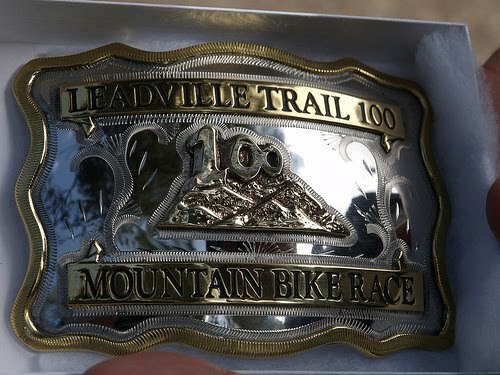 If you finish the 100 mile, high altitude course in under twelve hours you are awarded a rodeo-style belt buckle. I want me one of those buckles. Leadville is an odd choice for me considering my newfound attitude of being a racer rather than a participant. In a Cat 4 road race or criterium I am out there actively racing, going head to head, but at Leadville I’d be back to my old ways of simply being in the “race” to “finish.” The Leadville 100 does set a fairly high water mark of demanding that you finish in a respectable time to get the buckle, so I guess that helps. Not too many years ago a body could just send in their registration form, pay the entry fee and race the Leadville 100 (you may notice that I’m not going to use the corporate sponsored so-called official name of the race), but now you have to either qualify or win a lottery. I’ll have to enroll in law school to actually figure out all the legalize regarding entry to the race, but suffice it to say that if you don’t win the lottery or place first in a qualifying race it’s pretty dang complicated. Looking at Leadville would put me back into this whole trying to qualify chasing your tail crap that I experienced via Ironman – the more things change the more they stay the same.